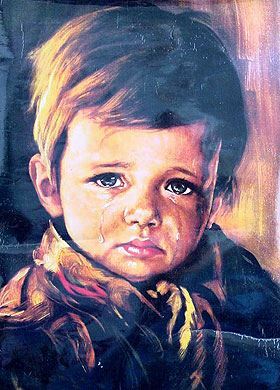 Bruno Amadio's "The Crying Boy,"
One of the many variations of Bruno Amadio's "The Crying Boy," it became infamous with the British tabloid, The Sun, bringing a string of house fires to light. Claiming that in many house fires, there was a copy, or a variation of a painting like this, where the whole house would burn except the portrait. Although there is much speculation as to whether this legend holds any water, many people refuse to have a portrait of a crying boy in their house to this day.